Comprehensive benchmark suites have a tough life. Whereas a gaming or CPU benchmark can dive directly into the hardware with a few specialized tests, system-wide benching packages not only have to cover each major component, they also have the added burden of tabulating those results into a single number. Which carries more weight in the final tally, hard drive performance or the video card frame rate? Are all the subsystems weighed equally? It's a balancing act, and the decisions made here make or break the suite. Auslogics tackles these problems and go the comprehensive route with their new benchmarking suite and related website community, BenchTown. Currently in beta, BenchTown shows promise, but it's not yet capable of producing reliable benchmarks. Auslogics BenchTown, now in beta, looks great. It's too bad it’s not working yet. The BenchTown suite is attractively presented, quick and delivers easy-to-understand test results. Five areas are covered: CPU, memory, hard disk and 2d/3d graphics. The results of these tests are ranked in an online community similar to Futuremark's 3DMark.com, where users can compare their system scores with users from around the world and see it all in context. A handy system information function lists the installed hardware and OS version in detail. The software itself boasts a tiny system imprint, and the installer doesn't try to sneak search engine task bars or other nonsense onto your computer. In fact, everything seems spiffy until you start comparing results. Then it starts to fall apart. The problem here is accuracy. While the framework established for this admittedly beta product is stable, the actual tests produce spurious numbers and inaccurate results. 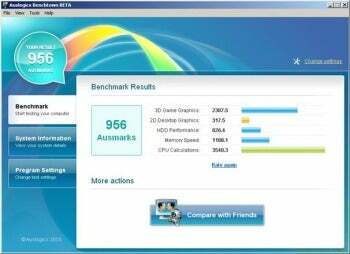 The Radeon 5770 HD videocard used on my test system consistently scored equal to or higher than competing cards which outperform it in the real world, such as Nvidia 460GTX based models. That's not all. Dual graphics card SLI/Crossfire systems don't register improved performance over single-card solutions, and CPU/memory tests produce similarly erroneous results, favoring some hardware configurations over others. At this time, the beta code seems broken. Auslogics is busy working on fixes. Although a worthwhile product is emerging, right now the problems with Benchtown overshadow the benefits. That's not to say this will remain the case, as the folks as Auslogic have proven they know how to polish a product to a high shine with packages such as Disk Defrag. In the meantime, if you decide to give it a test drive, expect more questions about the software than answers about your hardware. Sometimes, beta really does mean unfinished. Despite some appealing features, Auslogics BenchTown is not quite ready for prime time.